My name is Ryan Humphrey. I am 31 years old, and have been diagnosed with an angiosarcoma. I have a separate section detailing my diagnosis and treatment. Here I would like to tell you a little bit about my life. I am married to a beautiful woman named Andrea. We have two loveable boys named Landon (2010) and Logan (2012). Despite everything, my life is a blessed one. I graduated from Western Michigan University with a bachelor’s in Aviation Flight Science with the dream of flying for an airline. My dream came true only 8 months later with American Eagle Airlines. I absolutely love to fly, and everything that comes with it. People in aviation are very close because we share a unique passion in the sky. Every person I have worked with and met while pursuing my dream have been amazing. Unfortunately, my ailment has clipped my wings for the moment, and I miss it every day. I still keep in contact with many of my colleagues, and I can live vicariously through them. My family is everything to me. I grew up with a very large and close family, and that has paid dividends the world over in our current situation. I would do anything for my family, and they would do the same for me. Letters From My Family – I rarely like to talk about myself, and a good friend of mine had a great idea. She suggested to get letters from the ones I love to describe my life. I will leave you with those letters, and I thank you for taking the time to visit our site. Moreover, thank you for taking this journey with us. We love you all! Dearest Ryan: I am Brad’s Mom. I cannot begin to tell you how much your friendship means to him. I am a pediatric nurse in Arkansas and still have a deep love for Michigan in the Spring, Summer, and Fall. Notice I left Winter out of the picture. Brad is keeping me posted on your status. I know that Round 2 began yesterday. I also know that the power of prayer is great and you have people in Arkansas praying for you and your family daily. Those people you will probably never meet but that’s okay because you don’t have to. I am so excited to hear about the rapidly approaching birth of baby boy number 2. How exciting that day will be! God will give you the strength you need to be at Andrea’s side every step of the way. Just know that you are in my heart and my prayers daily. I hope to be able to meet you all in the Fall when we see Brad. Keep your faith strong, live everyday to the fullest and mind over matter is a powerful source in your healing. Thank you for sending the email with your new website. I forwarded it on to Judy as well. We want you to know that you are on our minds and in our prayers. 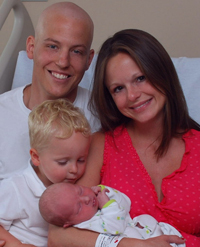 You have a beautiful family and we can’t wait to see pictures of your newborn baby, Logan. I just started perusing the website and finished reading the letter from your Father. I tend to get a little emotional reading family letters so it may take me awhile to read them all. At the end of the day, I ask Our Lord to send His angels on their way to watch over you and your family each and every day. Your extended family here in Florida wishes you a speedy recovery and congratulates you and Andrea on the upcoming birth of your son, Logan. God Bless You, Ryan. You and your family have been heavy on my heart for quite some time. It is a mystery how God works. I’m sure that there are people out there, myself included who wonder at God’s sovereignty. But He is sovereign and knows beyond any of our understanding what is best for us. You and your family are filled with so much hope, it truly is an inspiration, and I’m sure I’m not the only one who feels like if it were at all possible, we would take on that challenge for you and trade places. I’m sure God knows why some people go through these things, and some of us are spared. Ryan, I may have met you once through mutual friends, but know that there are people out here who have been truly touched by what you are going through, and seek God more diligently and feel a deep sense of wanting to help take on the burden of a brother in need. My prayers are with you. Am from India and i counsel with Tata Cancer Institute of India, i had joined the Sarcoma Group as a dear school friend was fighting a battle with Sarcoma Cancer. I Would like to say that you are indeed an inspiration.